Surround yourself with beauty, relaxation and natural fun in Georgia's Blue Ridge. Blue Ridge is located on the North Carolina – Tennessee line, only 1.5 hours north of Atlanta via I-575, within easy reach of the best attractions in the mountains of north Georgia, western North Carolina and eastern Tennessee. Enjoy a spectacular mountain view from the porch of a cozy mountain cabin or luxury vacation home. Renew your spirit on a day hiking to nearby waterfalls or horseback riding on forested trails in the Chattahoochee National Forest. Looking for quiet romance or peace of mind? Try spending the day watching the sun glimmer across the aqua blue waters of Lake Blue Ridge or crystal clear Toccoa River. This family-friendly burb hosts nearly two dozen festivals and events each year, including favorites Blairsville Scottish Festival in June and the Sorghum Festival in October. There are deluxe cabin accommodations tucked all over the county with stunning views of woods and water. 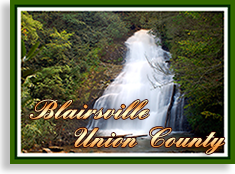 Blairsville-Union County is a perfect choice for any season! One of the best kept secrets in Western North Carolina is Cherokee County with its three towns – Andrews, Murphy and Brasstown. Tucked as far south and west in North Carolina, Cherokee County is known as the “Gateway to the Smoky Mountains.” Visitors will find outdoor adventures that include fishing, boating, hiking and more. This is a place where time stands still where one can put aside the pressures of the business and political worlds, sit on a deck, rock away your worries and gaze at a glorious sunset. When Traveling through the North Georgia & South Western North Carolina Mountain be sure to pick us a N. Georgia & SW North Carolina Travel Guide. Blue Ridge is Georgia's favorite mountain town 90 miles north of Atlanta and 90 miles south east of Chattanooga. Visit historic downtown Blue Ridge for a unique shopping experience, ride the scenic railroad, spend time on Lake Blue Ridge, go to a drive-in movie and dine at some truly wonderful restaurants. You will find a festival of one kind or another in Downtown Blue Ridge almost every month of the year.